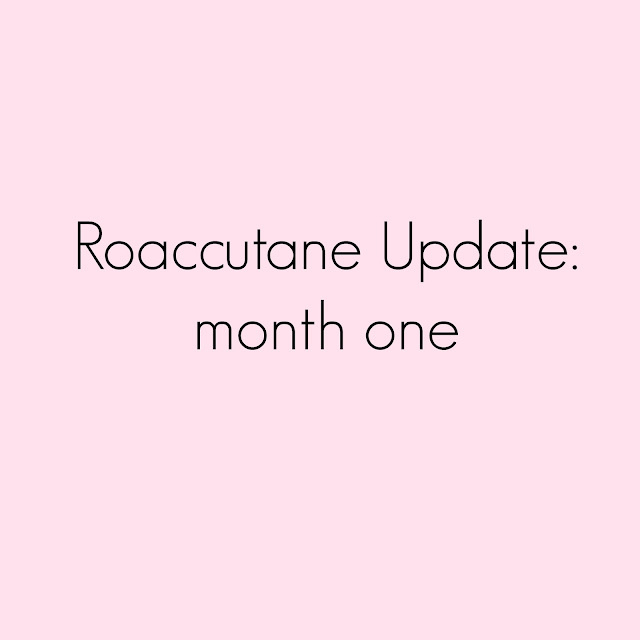 Within two days of starting the medication my skin really calmed down, which to be honest I think was down to the steroids rather than the Roaccutane. The awful skin I’d been dealing with made way for small breakouts on my chin and right cheek, but despite having lots of smaller breakouts it was better than what I had on my face over Christmas. After one full week of taking the Roaccutane and three steroid tablets a day my chin felt like it was on fire. Week two saw my dose of steroids drop to two tablets a day and my chin area pretty much exploding, it was incredibly painful and covered in lots of small under the skin spots. Some would come up to a head and I’d generally wake up to around two new whiteheads each morning (sorry guys, didn't say this was going to make pretty reading but may as well be truthful). I'm not sure if it was a knock on from the medication or from how upsetting I found this initial breakout, but I spent the week exhausted and overly emotional. The area where my original cyst was became really red and this area spread out along my jaw. Week three was a mixed bag, whilst my chin was really red and inflamed the pain had subsided. I dropped to one steroid a day, which was scary as these were what was originally keeping my skin under control. I experienced fewer whiteheads but still lots of under the skin spots, my skin definitely looked worse with make up on but I wanted to hide the redness when I was out. Week four meant stopping the steroids, I took my last one on the Tuesday and hoped for the best. On my first steroid-less day I woke up with my skin looking a little better, it was definitely smoother in places. However, the area where I'd experienced the worst of my Christmas breakout was starting to flare up again. It looked like a cyst was brewing under the surface, it was tight and I was very aware of it when I moved my mouth. By the end of the day it had thankfully eased off but not after some absolute grossness I had to deal with in work, I'll spare you the details. I've got a long, long way to go. From reading the experiences of other people it seems like the first month of Roaccutane is the worst for an initial breakout, so I'm currently living in hope that from now on things will get better. I've had my first dermatology appointment, the consultant agreed that my skin is looking better than the last time he saw me. He's prescribed three months of 20mg tablets to be taken once a day as he thinks that increasing the dose will cause my skin to flare up even more. My next follow up is in two months time when I'm hoping I can go to the appointment without make up but we'll see if that's a bit far fetched.